Pure South-East winds at 32-43knots with no swell. 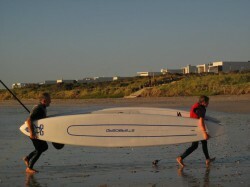 Combine that with the spring tides draining Table Bay and we had the fastest downwind conveyor-belt to date. Virtually every paddler improved his/her times, with the only exceptions being those who were still chatting to time-keepers in the parking-lot when the start went off, plus those who kindly chose to chaperone their kids or first timers. Such were the conditions though, that even newbies who found standing up too testing set great times merely sitting on their boards the entire way! 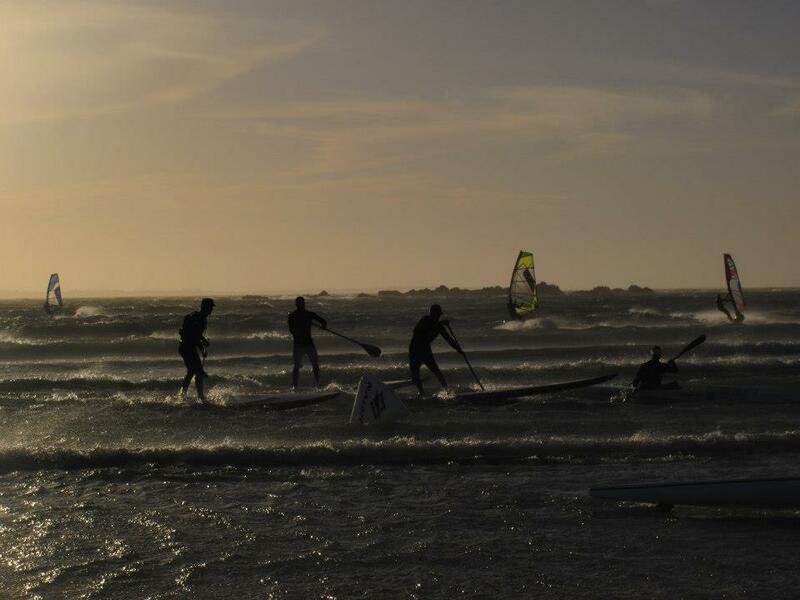 A total of 44 SUPs and 40 surf-ski paddlers made it a great spectacle as sand was flying and the water was lifting in the gusts. Right off the beach it was clear that two guys had their eye on this race. 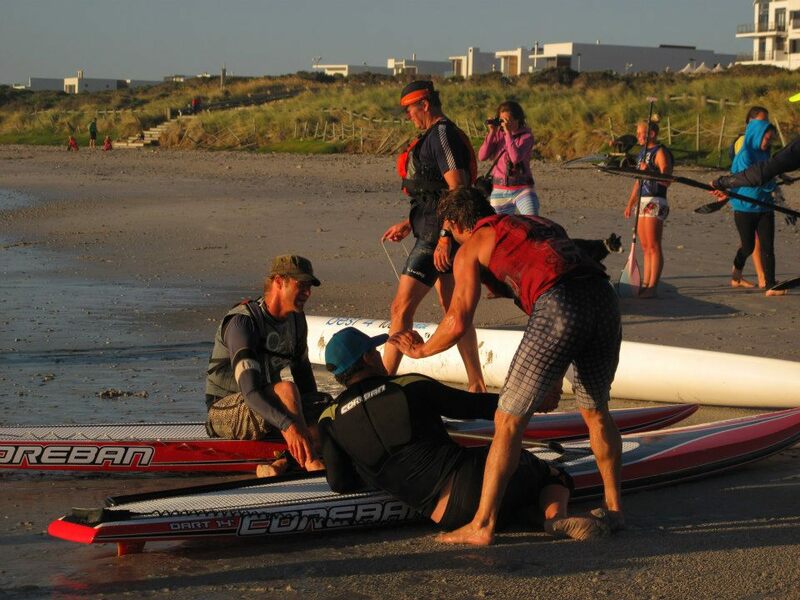 Greg Bertish set off like a rocket and immediately created a gap, while Coreban founder Ivan van Vuuren paddled out deeper and flew down the course. Chris Bertish arrived at the beach three minutes before the start and was still chatting to the time-keepers when the whistle blew. He nevertheless set off in his usual style and by halfway had cleared everyone but the two frontrunners. By the entry to Small Bay, Chris had caught both brother Greg and Ivan, and they crossed the sand-spit together. Chris, nursing a mild chest-infection told Greg to go for gold in the last 200m sprint – this must have been the red rag that Ivan needed because he put his head down and just beat Greg in the run-up to the flags – setting a new course record in the process with a 42 minutes 57 seconds. Ivan’s time makes an extraordinary average speed of more than 14km/h over the entire 10.1km course. Greg also beat the previous record with his 43:02, while Chris eclipsed his own previous course record with 43:29 (the previous record stood for over two years). 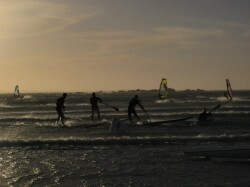 It was great to see Cape Town’s three downwind pioneers share the spoils tonight! Ivan van Vuuren may have withdrawn a little from the commercial side of SUP but the classy legend showed everyone how its done when the conditions are really cooking – big congrats on the new course record – it will be hard to beat! 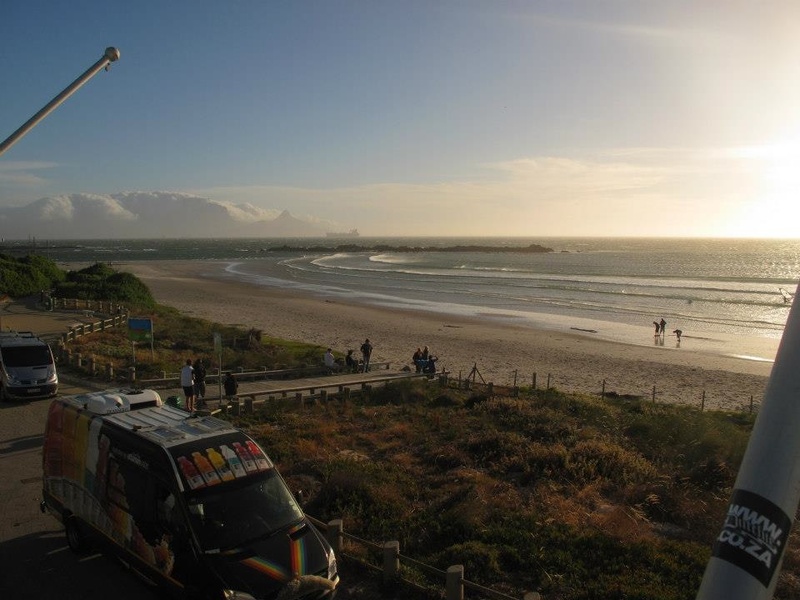 The young Brat-pack where properly schooled this evening with Colin Heckroodt, Dylan Frick and Brad Adams coming in over two minutes behind the leaders – though they all made huge improvements on their PBs and just need a few more big ones to challenge the old guard. The ladies were flying and four out of the six entrants finishing under in one hour. Brigette van Aswegen nearly even dropped under 50 minutes! Great times by the ladies and another course record for Brigette in 50.58. Mishka Steyn and Karina Figl had never been under one hour, nor had Monica Wohlgemuth who came in 4th. Michaela Gabriel made a welcome comeback to downwinding after having been lost to the lure of prone-surfing for a good while. Michaela couldn’t stop smiling and neither could Maleen Hoekstra, who completed her maiden voyage in 1:07:30. The Juniors (up to 16yo) really look to be serious challengers in the future with Ethan Koopmans setting a new junior course record of 47:37. Joshua Robertson once again had to settle for second while first timer Matthew Maxwell came 3rd in 53.50. Matthew even beat his dad Dave – as they crossed the line the youngster cleverly made sure that he took hold of the front of the boards while his dad took care of the tails ensuring he’d cross the line first! We had two DNF’s with Mike Smith and George Muller having chosen a too tight line and having to exit at Doodles. Everyone made it home safe and sound despite numerous spectacular crashes with 14’ boards doing the death spin at the end of their leashes! One guys leash had spun so many times they could barely get the leash off the board! Everyone had their own stories to tell and virtually everyone took home a PB. We have two more races to go this year and with 7 out of the 8 weeks delivering race-worthy conditions (and a good forecast for next Wednesday) we continue to enjoy the great downwind conditions that Cape Town has to offer. There are now two discards in the overall results and if we can complete the last two races then we’ll have one more result to drop – so you can still make up places in overall ranking! Big thanks to our time keepers Lollo and Jen + Aden and Deanna, BBLSC and of course our sponsors: PRIMI, Naish, BulkSMS, SUPHQ, Vitamin Water, Buchulife, SWOX, Coreban/Xpression, New Balance and Watersports Warehouse.